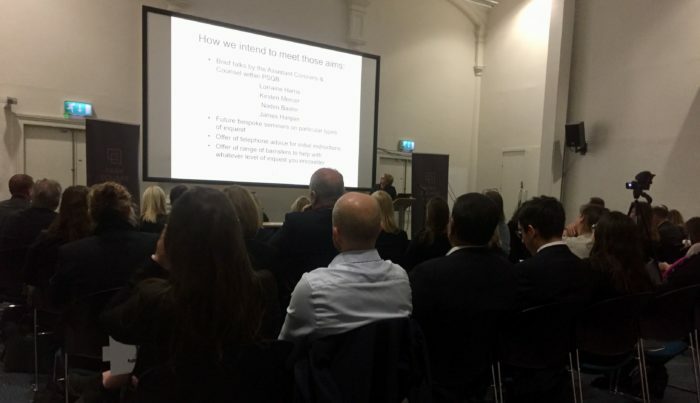 The event attracted 70 delegates who attended from far and wide (Newcastle, York, Hull and Rotherham) as well as locally based firms and provided a great networking opportunity for those attending. It was lovely to have the opportunity to meet up with old friends as well as making new ones. This was the first in a series of seminars on Inquests which will take place this year so watch this space for announcements! Our established and sizeable Regulatory & Public Law team has a breadth & depth of experience in cases involving all aspects of regulatory crime including but not limited to Inquests, Health & Safety, Environmental Law, Food Safety (particularly involving allergens), Fire Safety & cases involving the Care Quality Commission. The team are always keen to hear your suggestions for topics for future training requirements. If you would like to make any such suggestions or requests or indeed to discuss any aspect of the teams work then please do not hesitate to contact our clerk Madeleine Gray at madeleine@psqb.co.uk or 0113 202 86 06. We would like to thank our speakers Lorraine Harris, Kirsten Mercer, Nadim Bashir and James Hargan, but most of all we would like to thank all of our attendees for their warm reception and look forward to seeing you all again soon!